Soundbars are compact home theaters, and they can get also compact on your pockets when it comes to price. Easily you can get many great models under the quote of 300 bucks and still have a great deal of a stereo system to boost your TV experience. Check our hot list with 5 of the best soundbars under 300 dollars and some tips to get the best one. 2 What the Best soundbars under 300 dollars Must Have? 2.1 Are the subwoofers of Soundbars Under 300 Dollars Worth It? 2.2 What Our Reviews Have to Say? 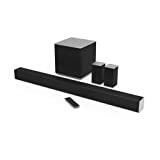 VIZIO has several different sets of speakers, and the C0 is one of their ultimate budget designs as you can get it for less than 300 bucks. Even though, it offers a 5.1 surround experience and has the essential separate wireless subwoofer included. One of the great things about this model is its remote control, which is developed with a LCD screen. 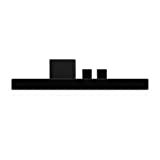 Most sound bars come with a simple remote, you can’t see what you are setting for volume and other sound properties. That uncertainty is finished finally with this model.This is the best sound bar under $300 on market today. Quite powerful and dynamic set with the wireless subwoofer. The LCD screen of the remote makes is one of the greatest additions of the set. Finally a sound bar where you can really see how high is the volume, the bass, treble and so on. Available both on 38 inches and 40 inches. Sony does very well how to develop great sound quality in the most unusual ways. Their HT-XT1 sound bar is one of the most refined models under 300 bucks you will find out there, even though it comes with the cost that you only have 2.1 channels here. On the other hand, this sound bar set provides powerful subwoofer output with its great downward design. As a plus, you can connect it to several different kinds of devices making use of more than only Bluetooth connection, you can also use NFC.4 and HDMI3 doors as well as analog and optical aux ports. Powerful flat system with a built-in subwoofer that will save space and not waste quality. LG also has its tricks when it comes do design and they mostly really hit the target here with their multi connectivity system like the Sony model. Meanwhile, this is a better option for people who really want to enjoy a subwoofer separately as this channel is not built-in in this model. In the end, LG’s sound bar is also mountable on the wall which is a great plus to save the space the subwoofer might use. Includes 1 HDMI ports (in and out), 1 aux optical and 1 USB service port. Offers the same amount of extra connectivity like the Sony model. 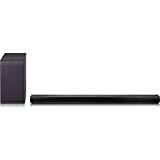 A top seller 2.1 sound bar, this VIZIO model is a budget option with a powerful subwoofer. 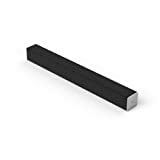 Many people looking for a standard sound bar stick to this kind of model as it is more affordable and includes the external subwoofer to increase quality. 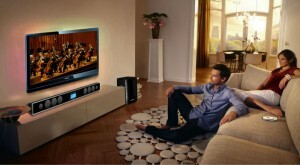 Is a great option to enhance the capacity of your TV with no need to set a whole home theater structure. 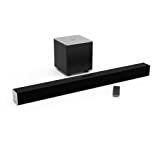 The last sound bar of our list for best sound bar under 300 dollars is a compact version of the previous VIZIO model, this one developed only with the speakers system. Like the previous model, is also mountable on wall, will fit slim and fancy on your room and is the best option to save space. On the other hand, it won’t waste quality. Losing only a subwoofer channel, it still keep a powerful 95 dB of potency. What the Best soundbars under 300 dollars Must Have? For this budget you must always look for potency and amount of channels. As you can see, 5.1 is the upper edge, but you can still get a great system for this quote. Potency is also important as these system must be at least 95 db, but if you can get numbers that go over 100 dB, the better, go for it. Are the subwoofers of Soundbars Under 300 Dollars Worth It? There is a myth that expensive soundbar sets have outstanding subwoofer channels. The presence of a subwoofer is not exactly what makes a set expensive or not, and the lack of it surely doesn’t make a soundbar automatically under the 300 quote we established here. What really talks when the matter is price is the overall number of speaker channels. All soundbar models offer a standard subwoofer channel, they don’t get really better as the prices skyrocket. On our list you can see most models have either a built-in subwoofers or external ones (only last model doesn’t include one). Soundbars are in essence compact sound systems, they are meant to fit easily on your room, so the subwoofer, even if present in 90% of our models here, is not what makes it a big deal for under 300 dollars, but they are surely worth it because they are equally good as subwoofers of sets over 300 dollars. For the people who have high standards and are looking for a bargain, models like the VIZIO C.0 and the Sony HT-XT1 are some great options, especially the latter as it has a great design and is after all, a Sony set. For this quote of 300 dollars, you also have the option to try things, so the most accessible sets are good for people who would like, for instance, to buy separate subwoofer channels, or those who just want to really boost their TV’s sound system with much better 2 channel stereo outputs. The consensus is, after all, you have some great models in promotional sale, and most of them were released in 2015, so they are brand new, ultimate technology.